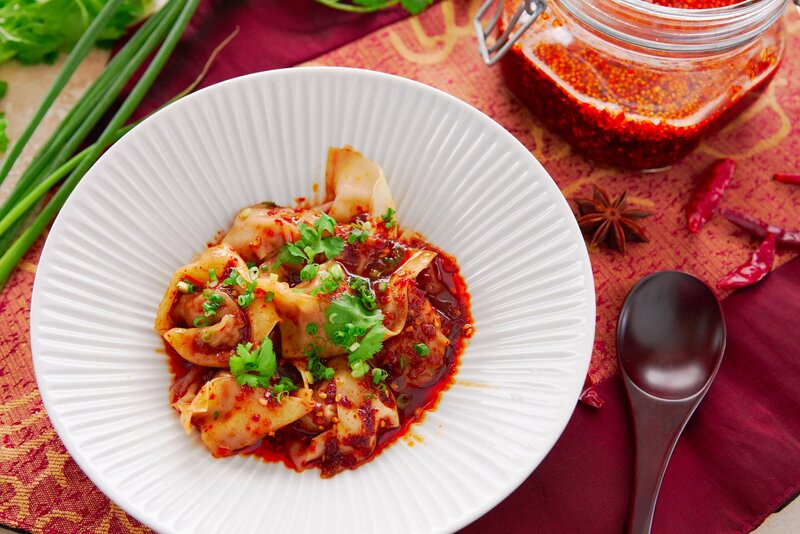 With a tender pork filling wrapped in a slick noodle, these Spicy Wontons get tossed in a fiery Sichuan-style sauce that's loaded with umami. They make for an appetite-boosting starter or satisfying main that can be prepped ahead and served in a matter of minutes. When you hear the word “wonton”, you might associate it with “soup.” That’s because the original migrants who brought Chinese food to America came from port cities in southern China, where wontons are typically served in soup. I’ve posted my take on a Cantonese-style wonton noodle soup before, which reflects the region’s proximity to the ocean by including shrimp in the dumplings and serving them in a seafood-based broth. China is a big country though, and other regions have their own take on this diminutive dumpling. In Sichuan Province, the dish is called hóng yóu chāoshǒu(红油抄手), which literally means “red oil crossed hands” one look at the vermillion chili oil glazing the wontons gives away the first half of the name, and if you look at the uncooked wontons from a certain angle, they do look a bit like crossed hands. 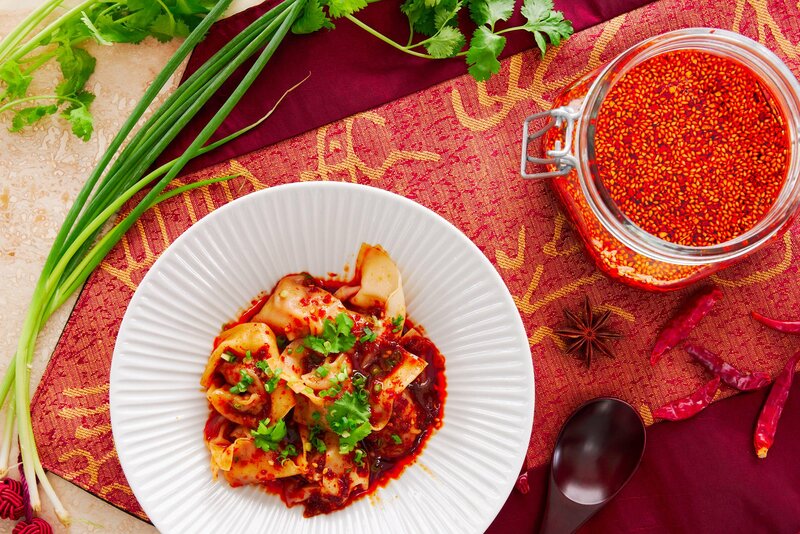 Sichuan is a landlocked province in southwestern China that’s known for their blazing hot cuisine which is driven by the region’s affinity for chili peppers and the tongue-tingling Sichuan peppercorn. Wontons from this region are usually made with pork, instead of seafood, and they’re served with a piquant sauce that strikes the perfect balance between spicy, savory, sweet, and sour. 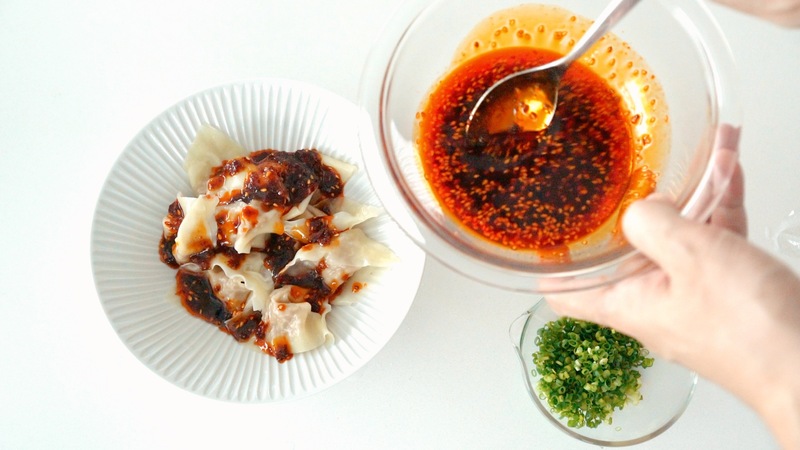 The primary ingredient in the sauce for Spicy Wontons is chili oil. While you can get this in jars at Asian grocery stores, I highly recommend making it yourself as it allows you to make one that’s just the right spiciness for you. Check out my recipe for making Homemade Chili Oil. It’s fairly simple to do, and it’s so good, you’ll find yourself drizzling it on everything. The sauce is traditionally seasoned with a spiced sweet soy sauce which is what gives the sauce it’s unique sweet herbal flavor. Since my version of chili oil already includes these herbal notes, I just use an ordinary sweet soy sauce like Kecap Manis for this. Since Kecap Manis is a bit too sweet on its own, I like to blend it with regular soy sauce, so you get a nice balance of sweet and savory. If you can’t get your hands on sweet soy sauce, you can make it by cooking some unrefined brown sugar or palm sugar with soy sauce. As for the vinegar, you want to look for one that says Chinkiang Vinegar or Zhenjiang Vinegar. The vinegar is black, and as the color would suggest, it has a full-bodied flavor thanks to the unique fermentation and aging process it undergoes. Compared to regular rice vinegar, it’s less tart and has a mild sweetness that makes it a wonderful ingredient to have in the pantry. If you can’t find this Chinese black vinegar near you, a bottle of fake Balsamic vinegar will work in a pinch. I know that seems like an odd piece of advice, but real balsamic is too sweet and viscous for this dish. Finally, I like to add a bit of raw garlic to the sauce. My chili oil has a ton of caramelized garlic in it, but fresh garlic has a different spicy kick that lends a pungent note to this flavorful sauce. One thing that most wontons have in common is that they tend to have a high wrapper to filling ratio, which makes them look a bit like a Siamese fighting fish when boiled. You see, unlike Shumai, where you’re meant to enjoy the filling, wontons are all about the slick noodly wrapper. In order to maximize the enjoyment of the wrapper, I like to keep my filling simple. Instead of adding chopped aromatics like ginger, garlic or scallions to the filling, I use ginger juice and leave the garlic and scallions for the sauce. This creates a soft pillowy filling without any contrasting textures that would clash with the satiny wrappers. This allows the umami-rich filling to harmonize with the ultra flavorful chili oil creating an excellent balance of tastes and textures. Beyond the ginger juice, I add just a bit of Shaoxing wine, Chinese five spice, and white pepper to the filling and then bind it all together with an egg and some potato starch. These later ingredients will gel as the wonton cooks though, capturing any juices released by the pork before they have a chance to escape into the boiling liquid. Because of the relatively high ratio of egg to meat, the filling will be a bit loose, but since you’re not going to put a bunch of filling into each wonton, this shouldn’t be a problem. 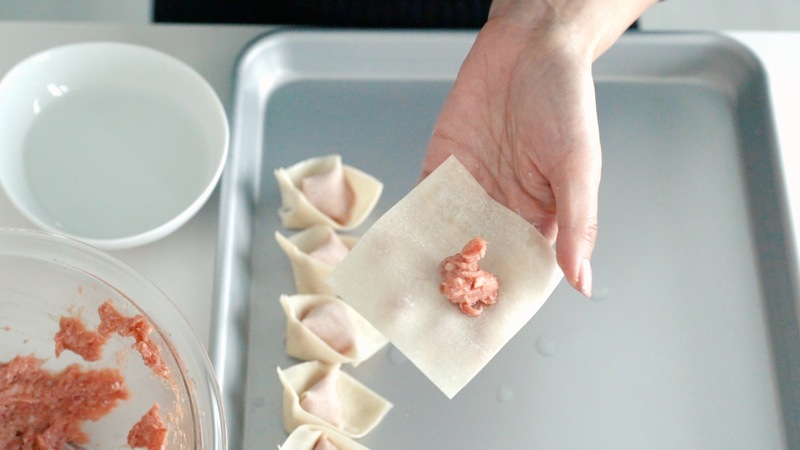 As for how to wrap the wonton, there are several methods, but since the name of this dish is “red oil crossed hands,” I like to cross the two long ends of the wonton together in the center. You can check out the video below for a more detailed guide on how to wrap these. To finish off my bowl of steamy wontons in chili oil, I like to sprinkle some chopped scallions and cilantro leaves on top. If you’re feeling brave, you can also grind some Sichuan pepper on top, which adds a wonderful touch of evergreen and citrus on the nose, and a numbing heat to the palette. The spicy sauce can be made up to a week in advance and kept in the fridge. 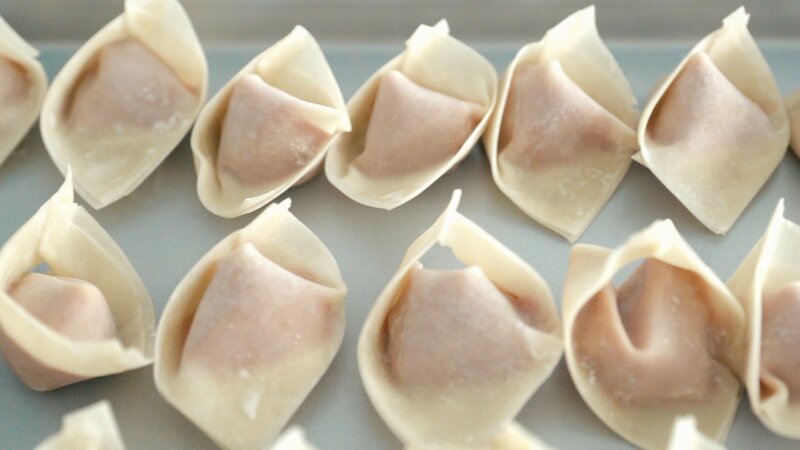 The wontons can be made up to a day in advance, but be sure to keep them on parchment paper with enough space between each one so that they don’t stick together. You can also freeze them on a sheet pan and then transfer them to a sealed container or bag for longer-term storage. If you do end up freezing the wontons, be sure to give them a little longer to cook through. 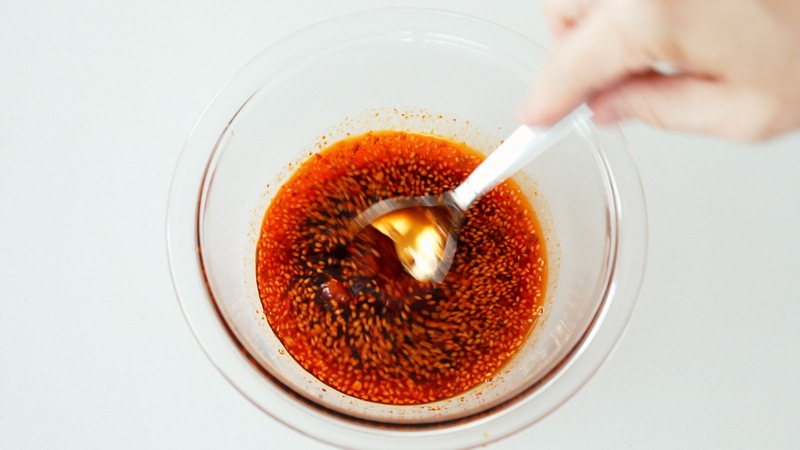 To make the sauce, whisk the chili oil, sweet soy sauce, regular soy sauce, black vinegar, and garlic together in a bowl. For the wontons, bring a large pot of water to a boil. 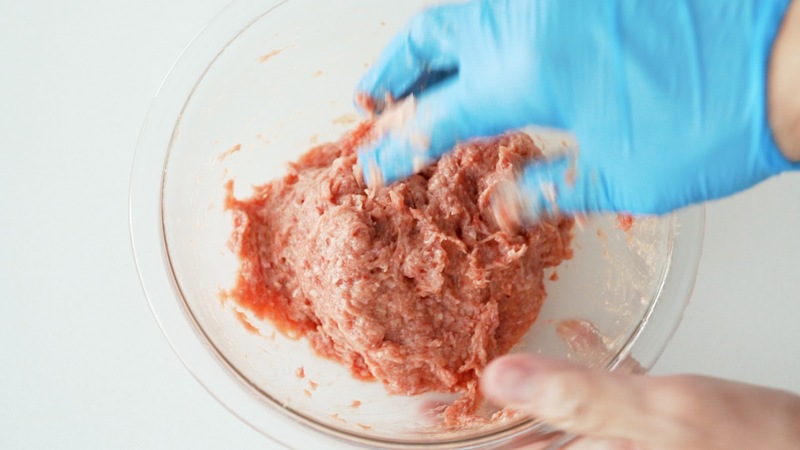 Add the ground pork, egg, Shaoxing wine, ginger juice, potato starch, toasted sesame oil, salt, Chinese five spice and white pepper to a bowl and use a gloved hand to first knead, and then beat the mixture together until uniform. 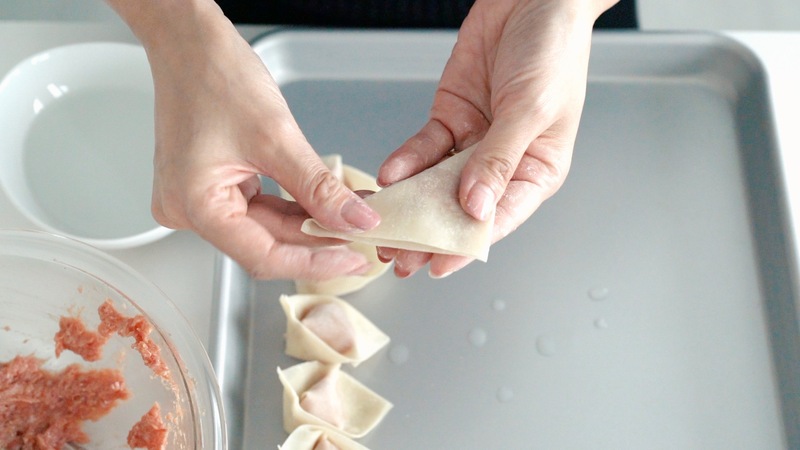 To wrap the wontons, place one wonton wrapper in the palm of your non-dominant hand and then add about 1 teaspoon of filling to the center of the wrapper. Wet two edges of the wrapper with a finger dipped in a bowl of water. 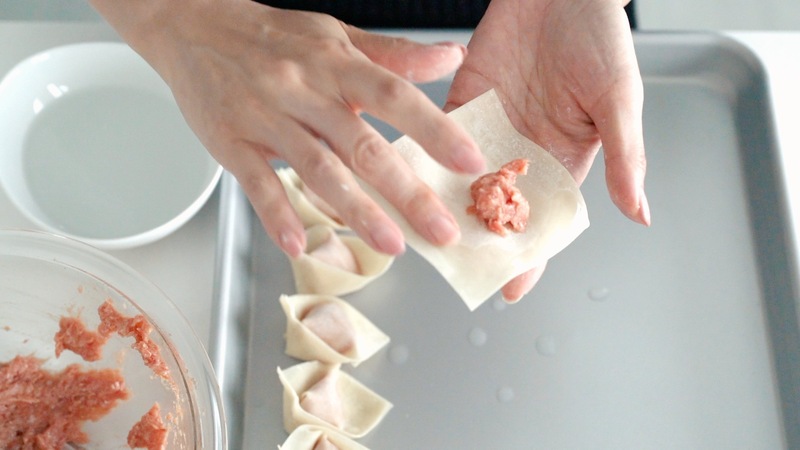 Fold the wonton wrapper over the filling to form a triangle. 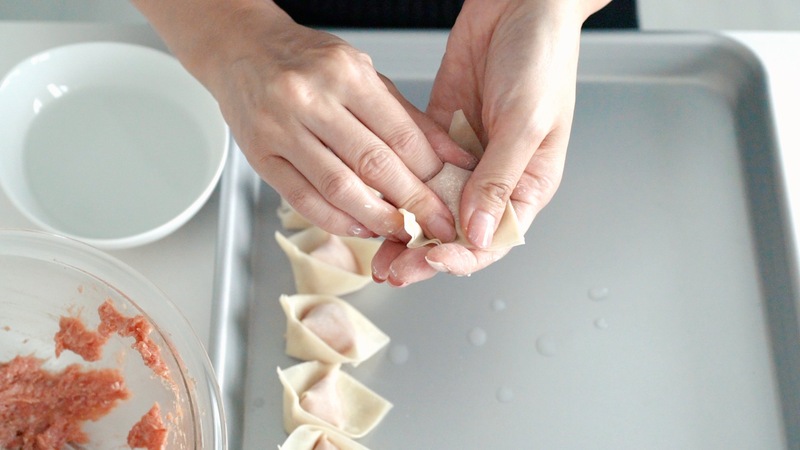 Place the index finger of your dominant hand below the center of the wonton, and then use your thumb and middle finger to press the corners of the wonton shut to seal it. This also forces out any air pockets, which will make your wonton explode when you boil it. 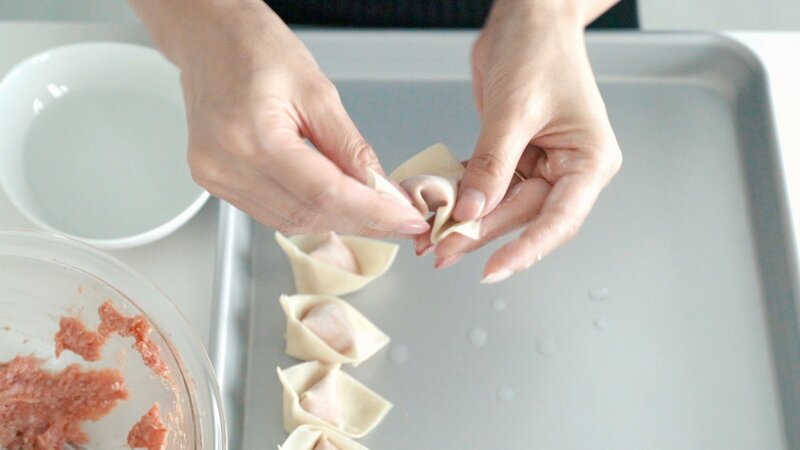 Bring the two long corners of the wrapper together at the center of the wonton and seal them together using a drop of water if needed. Working in batches, boil the wontons until they float to the surface, and then continue to cook them for another 30 seconds. 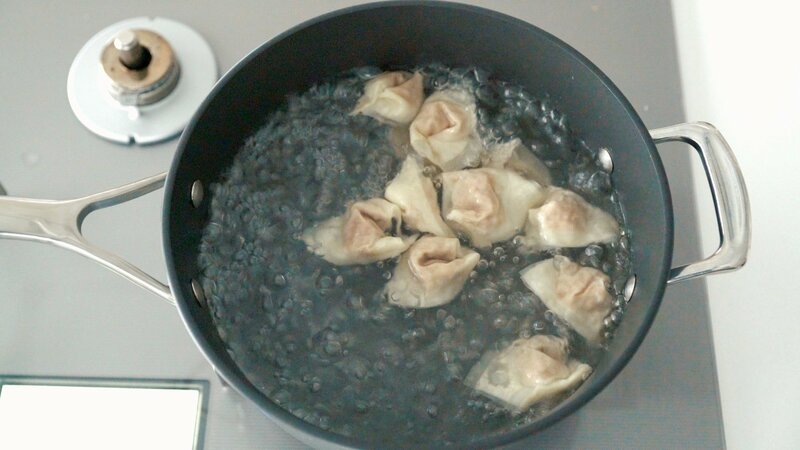 Your water should not stop boiling when you add the wontons. If it does, you either need to use a bigger pot with more water or add fewer wontons in the next batch. Once the wontons are done, use a slotted spoon to transfer the wontons to a bowl. You don't need to drain all the boiling liquid as this helps the sauce spread around. 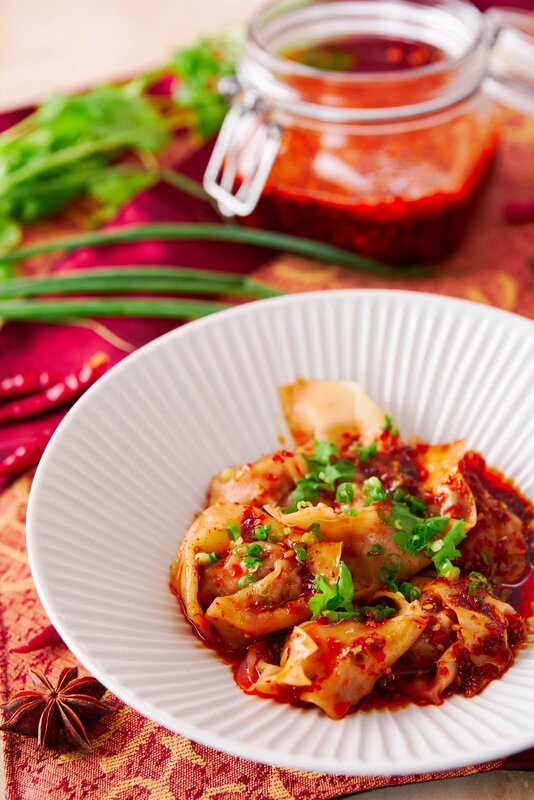 Drizzle the wontons with a generous amount of the spicy chili oil sauce and then garnish with scallions and cilantro. Hi Michelle, thanks! I hope you enjoy it!